Apple, grape and other seedlings (800) are distributed by the Hokkaido Development Commission. Table grapes are planted in Ohamanaka, and the successful cultivation of high-quality, good-tasting grapes is achieved. Dainipponkaju Co., Ltd. (the current Nikka Whisky Yoichi Distillery) is established. The Hokkaido Prefectural Central Agricultural Experiment Station of Naganuma Town starts growing trials of ten German wine grape varieties and nine Austrian wine grape varieties in Furano City and Niki Town. Nihon Seishu Co., Ltd. establishes the “Yoichi Wine” brand. Varieties that thrive in Hokkaido are determined: Mullerthurgau, Zweigeltrebe, Seibel 13053, Seibel 5279. Sapporo Wine Co., Ltd. and another company start test-growing wine grapes with growers in Yoichi. Sapporo Wine Co., Ltd. contracts with growers in Yoichi to grow wine grapes. The full-scale cultivation of wine grapes starts in Yoichi. 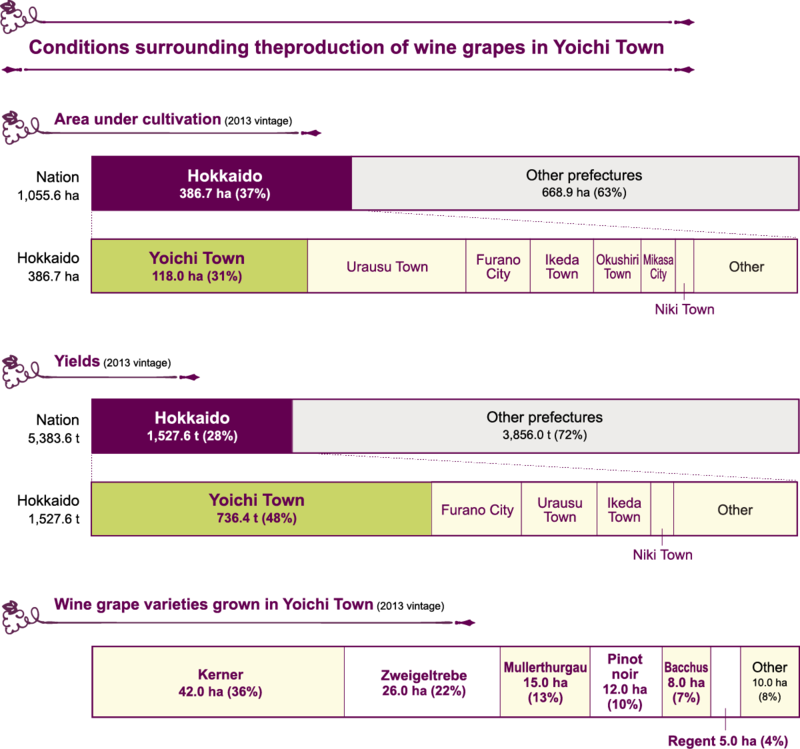 Yoichi Wine and three other companies contract with growers in Yoichi to grow wine grapes. Grace Wine contracts with growers in Yoichi to grow wine grapes. The Ikeda Town Grape and Wine Institute contracts with growers to grow wine grapes. The Domaine Takahiko winery opens. Yoichi Town is designated the Special District for Wine, Northern Fruit Kingdom in November. A plan for a special district for wine was submitted to the national government by the Town of Yoichi. 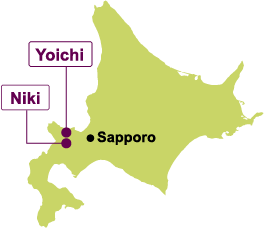 On November 28, 2011, the Prime Minister gave Yoichi the designation of a Special District for Wine, Northern Fruit Kingdom, the first special district to be approved for Hokkaido. Some regulations are eased for designated special districts. Two examples are given here. (1) When fruit wine or liqueur is produced from locally grown specialty farm products*, the minimum production requirement (6 kiloliters annually) stipulated by the Liquor Tax Act is reduced to 2 kiloliters for fruit wine and 1 kiloliter for liqueur. (2) When fruit wine is produced at a farmhouse inn or restaurant using fruit grown by the owner, the minimum production requirement (6 kiloliters annually) is waived. Rita Farm & Winery and OcciGabi Winery open. Domaine Atsushi Suzuki and Hirakawa Winery open. Yoichi Niki Wine Tourism Project is launched. Yoichi and Niki towns are at the base of the Shakotan Peninsula in western Hokkaido. Fruit-growing has flourished in these towns, thanks to climate that’s relatively mild for Hokkaido. The town is surrounded by lush greenery: About 66% of the town is mountains or forest, and about 15% is farmland. Yoichi produces more apples, grapes and pears than anywhere else in Hokkaido. The town is also blessed with shrimp, squid, flounder and other seafood. It’s famous as the northernmost limit of the sweetfish, the king of freshwater fish.